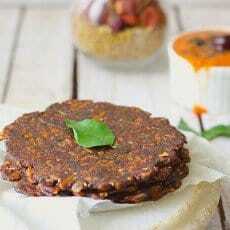 Ragi Rotti is a simple and healthy traditional flatbread of Karnataka. 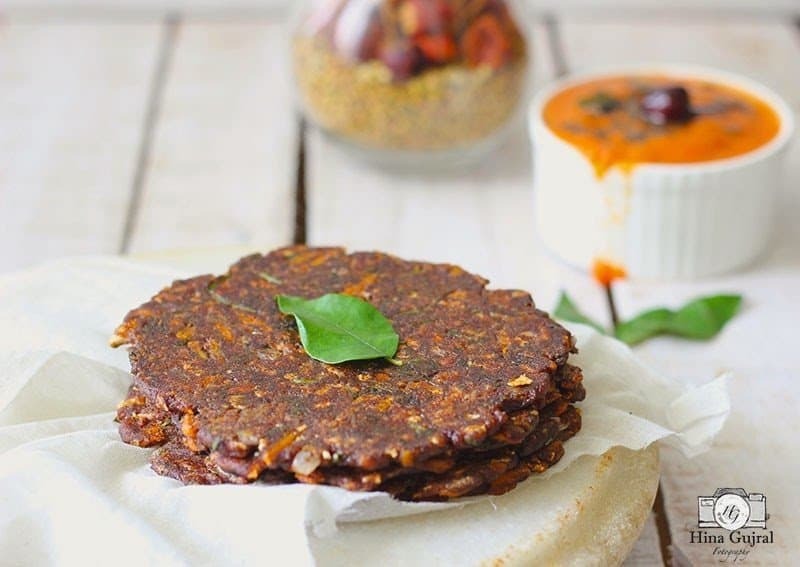 The finger millet flour is mixed with a variety of colourful seasonal vegetables and formed into the dough to make delicious bread served with a variety of condiments on the side. I settled for uncomplicated Tomato Chutney tempered with mustard seeds swimming in the ghee with some aromatic curry leaves. Ragi is one of the staple crops of Karnataka from the ancient era hence that explains the abundance of finger millet use in the cuisine of the state. Some of the conventional dishes of Karnataka has Ragi as the key ingredient like Ragi Dosa, Ragi Mudde, Ragi Idli and Ragi Ambli. While I was listing down recipes for the January month theme ‘Karnataka’ for #thekitchendivas (an endeavor to create a collection of recipes of Traditional Indian Cuisines in collaboration with a few bloggers who share the same passion of cooking) Ragi Rotti was one of the obvious choices to showcase the influence of local ingredients on the cuisine. Sometimes dishes that are loaded with health benefits are greeted with furrowed brows on the breakfast table, the mere presence of any such dish that does not satisfy the family criteria of good food, drain out the appetite from the table. Such healthy mornings (I address them as healthy mornings) are a rare occasion in my kitchen but with some experience as a house maker any premature announcements about the ingredients is avoided, so that the food on the plate could be tasted without any preconceived notions and taste buds share their genuine verdict about the same. 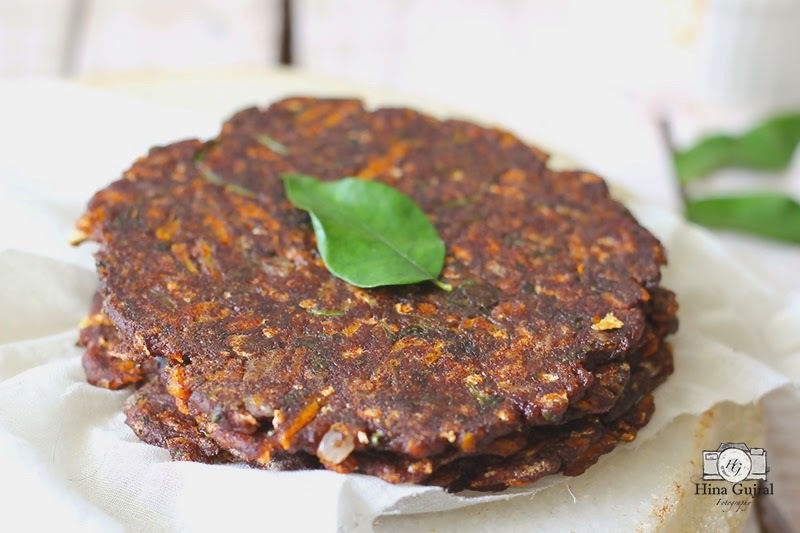 But Ragi Rotti is one exception to the above list, it has become a routine affair for the breakfast or lunch with humble Tomato Chutney and each bite of the flavoursome bread embedded with the sweetness of the carrot, freshness of coriander is dipped in radiant sloppy chutney with equal enthusiasm till the finishing line. 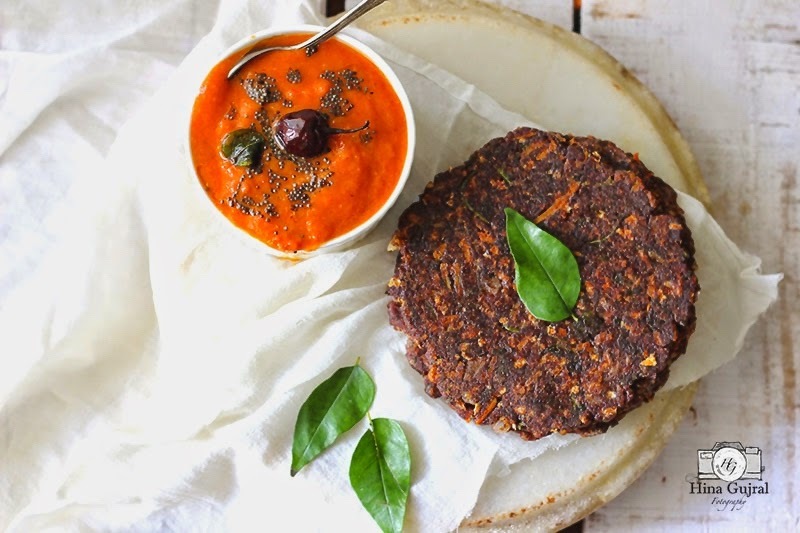 Ragi Rotti is a traditional flatbread of Karnataka, finger millet flour is mixed with colorful seasonal vegetables and formed into dough to make flat breads. To prepare the dough first finely chop onion, curry leaves and coriander. I prefer using food processor for this purpose to get even size fine chopped vegetables. In the food processor or electric chopper process onion, curry leaves, coriander together. Sift ragi flour into a large bowl. Add in chopped onion, curry leaves, coriander, grated carrot, salt and red chili powder. Mix the flour mixture nicely with fingers rubbing occasionally between palms to get crumbly texture. Now using little water at a time bind firm and soft to tough dough of ragi flour. Knead for 2 – 3 minutes shape into a round ball. Cover with a kitchen towel and let dough rest for 15 minutes. To make roti heat non-stick flat pan over medium heat. Line kitchen counter surface with a clean dry parchment paper. Grease it with 1 tsp of oil. Pinch a portion of dough and roll into a ball and then flatten the dough ball using fingers. Place the flatten dough ball over the parchment paper and with a rolling pin roll out to medium size roti of approximately 3 inch diameter. Ragi Roti is little thick so make sure not to roll it out too thin like regular chapati. The dough is sticky in nature so grease the rolling with oil and do not put too much pressure while rolling chapati. Place the roti from your palm to heated skillet ( buy it here ) and cook on both sides. Do not flip roti more than once or twice as it is bit fragile. Cover the pan with a lid and wait for 1 -2 minutes. Remove the lid. Pour 1/4 teaspoon of oil on the ragi roti. Flip the roti gently with a spatula. Cook roti on one side. Flip the rotti again after a few minutes. Pour 1/4 teaspoon of oil on the other side of roti. Cook till a few dark brown spots appear on both sides. Ragi rotti is ready. 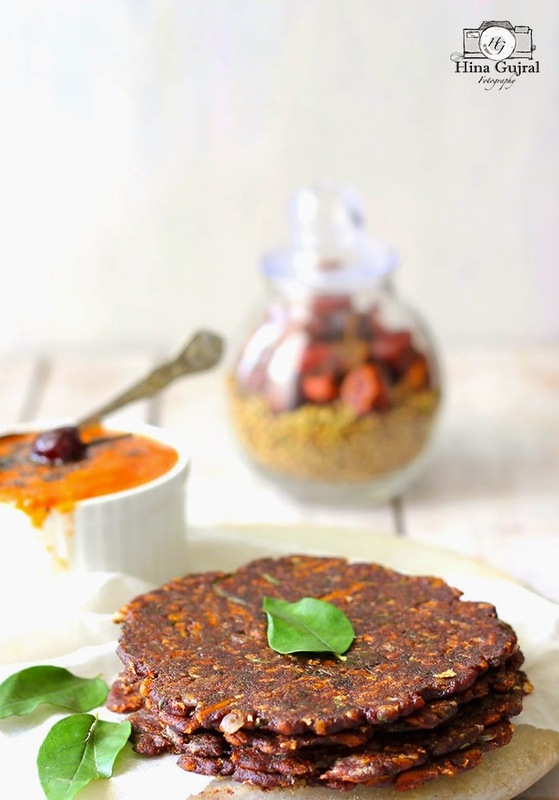 Serve Ragi Rotti hot with tomato chutney. 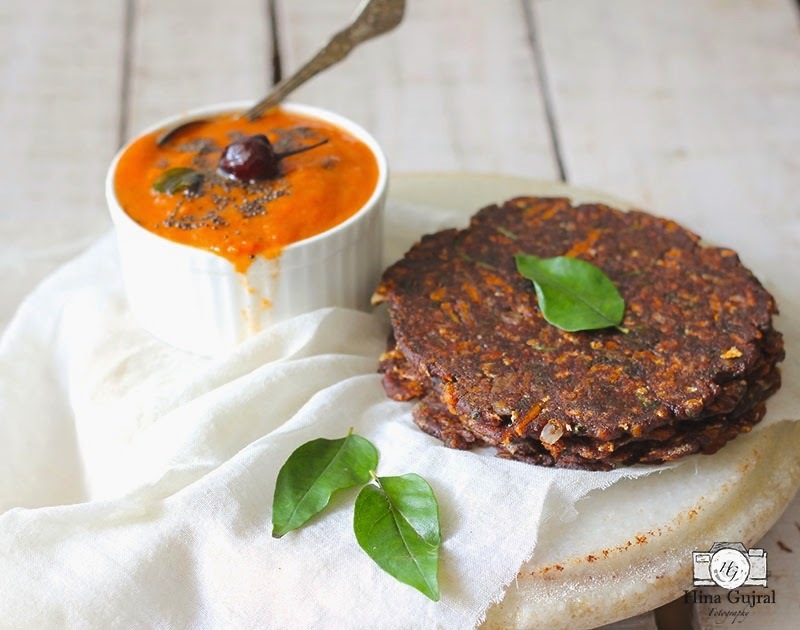 A delicious South Indian style tomato chutney perfect to serve with idli, dosa and uttapam. To prepare the chutney, heat oil in a pan over medium heat and saute onion, garlic until they turn light brown in color. Then add chopped tomato, salt, turmeric powder and chili powder. Fry the masala till tomato are soft and oil get separated from the masala. Turn off the heat and let masala cool down to room temperature. Blend the masala in mixer (buy it here) to smooth puree and transfer to a bowl. For tempering the chutney, heat ghee in a pan over medium heat. Add mustard seeds once they start making crackling noise add curry leaves and dry red chili. Fry for 1 – 2 minutes and then pour the tempering over the chutney. 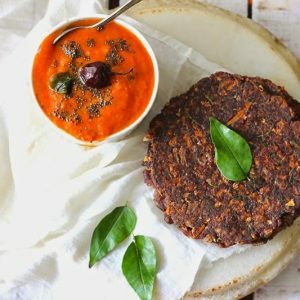 Serve Tomato Chutney with Ragi Rotti. sounds to be really interesting recipe. We need to try this for sure.